​Drummond Island is part of what geologist call the Engadine corona, which is a vast formation of dolomite originating on the eastern tip of Great Manitoulin Island and extending westward in a great arc to the vicinity of Manistique in Michigan’s Upper Peninsula. Dolomite, the underlying rock of Drummond Island, is calcium carbonate with a high percentage of magnesium carbonate. It gets its name from Dolomdeax, the French geologist who first identified it. Engadine Dolomite (named for the little Upper Peninsula community where it was first located) is the primary variety of dolomite of which Drummond Island is composed. 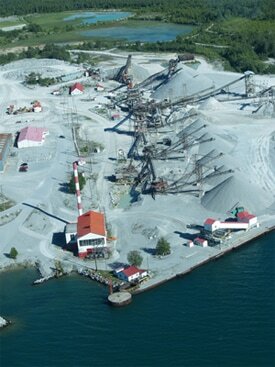 The Drummond Island quarry, owned by Carmeuse, that can be seen just to the south of the Drummond Island Ferry Docks, is a major producer of crushed and broken Engadine dolomite throughout the Great Lakes region. The quarry produces and ships out nearly a million and half tons of dolomite each year. Dolomite has uses in industry – steel making, glass making, paper making – even in the making of such medicines as Epson salts - but the steel industry is by far the greatest user. More on that later. Back in the early 1800’s, British soldiers, believing dolomite was ordinary limestone, burned it to extract the lime they used to build old Fort Drummond. Long after the British had gone, Americans employed Drummond Island rock to build the early locks at the Sault – and much of that rock was dolomite. In the late ‘twenties, T. L. Durocher, of DeTour opened the present Drummond Island Quarry to obtain rock for the construction and rip-rapping of docks and breakwaters on the Great Lakes. Mr. Durocher, a marine contractor, realized that the blocky nature of Engadine dolomite made it ideal for this purpose. Within a few years, several hundred thousand tons of it were quarried and transported for the repair and construction of marine installations at Frankfort, Mackinaw City, South Chicago, and other Great Lakes points. Greatly expanded steel production during World War II brought a virtually explosive consumption of dolomite – that demanded high volume, waterborne transportation. The quarry’s present operators, Drummond Dolomite Incorporated, filled that need in 1944 by dismantling and moving the company’s huge Sturgeon Bay, WI, plant to Drummond Island where, in the present quarry alone, the supply of high grade dolomite was believed sufficient for many generations. Drummond Dolomite Incorporated began producing during the summer of 1946. From a modest production of one quarter of a million tons that year, tonnage rose rapidly. 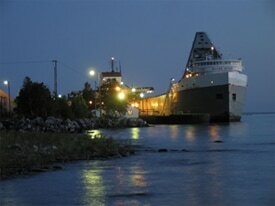 By 1949 Drummond Dolomite was a 24 –hour per day operation and they shipped out 2,275,000 tons that year. However, by 1960 the dolomite deposit at the plant site was becoming exhausted. An extensive exploration project was implemented and plans were made to open up a deposit for mining five miles east of the crushing, washing and screening plant. A super highway was built to accommodate 75 ton capacity haul trucks. Trucking from the new pit began in the spring of 1962. In 1968 Drummond Dolomite Incorporated was sold to Bethlehem Steel Corporation and continued to ship Dolomite in excess of 2.5 million tons per year. This was done with personnel of approximately 160 people. In 1987, because of economic downturns and competition from foreign steel makers, Bethlehem Steel decided to sell its quarries and mines. In the spring of 1988 Drummond Dolomite was taken over by Osborne Materials Company of Grand River, Ohio. Osborne Materials Company is now producing 1.3 million tons per year with approximately 30 people. Recently, Carmeuse owns and operates this quarry. Dolomite’s chief use, as stated, was in the steel industry, where it is used in blast furnaces as a flux, and in open hearth furnaces and foundries as a refractory material. It also is an important source of the metal, magnesium. Its toughness and hardness, as well as its structural soundness, make it an ideal aggregate for construction, including asphalt and concrete pavements. Dolomite’s high magnesium and calcium carbonate content gives it great value as a soil neutralizer, therefore it also hold an important place in agriculture. Once blasted into fragments, dolomite is prepared for market by crushing, washing, and screening at the processing plant that is seen from the Ferry as you approach the Drummond shore. Send me information about Drummond Island. NOTE: Due to the fire, there will be a delay getting information sent out. Please explore our website for information or call 906-493-5245. If you complete the form we will send out information as soon as possible. Thank you for understanding.